S: We talked about this a bit last week's opening talk but this week, I'd like to ask you about crepe. S: Then shall we talk about crepe? Off Cam Staff: Next week! N: People have been waiting for it, right? For one week. S: Are you the type who puts sweets in it or food, like snacks for example. N: I absolutely put sweets on mine. S: What sweets would you like with it? S: The classic style, huh. N: When I was small, I think the one who eats it was the most stylish kid (probably in his school). 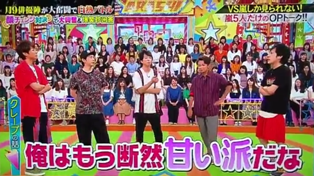 S: You Aiba-san, which one are you? M: Me, I like it salty. Something like pizza-ish. (Sample picture shown) When I was shooting my drama this year (99.9 Keiji Senmon Bengoshi), the catering crew had someone like a crepe maker. I'd eat it with everyone. S: So all of you get to eat crepes in between scenes of the drama? M: The catering car would come and serve it to us. S: (To N) You'd better do that (in your drama "Black Pean"). You still have time. N: Nah, it's already over. It's over. It should be him (points at A, who is filming a drama for the coming season). S: It's gonna likely spread in the industry. 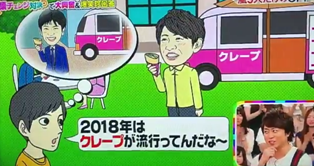 Someone will probably do that, the same caterer (handing crepes to) Arashi members in other filming sites. S: And people would be like, "It seems in 2018, crepe is 'in', huh~". Thank you so much for translating the opening talk.Otsukaresamadeshita.